Dexter 10,000 Lbs General Duty Dual Trailer Axle with 12-1/4" x 3-3/8" Electric Brakes Fully Assembled Axle With oil bath lubrication, 2.5" wide Slipper Springs and U-bolts assembled on the axle. 8 lug on 6.5" Bolt Pattern. This Dexter Trailer Axle is ready to install on the trailer. Dexter Axle D100GD (10000 lb) - Designed for General Duty applications. This axle system is known for its versatility, rugged reliability, and serviceability. It has been exhaustively tested and subjected to a full spectrum of operating conditions exceeding the predicted end uses of the axles. 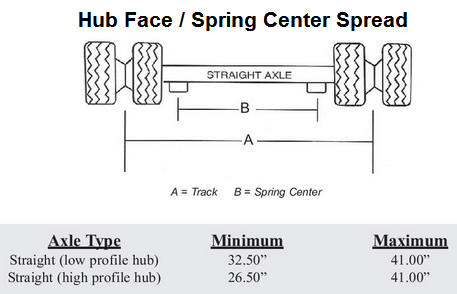 Hub & Drum One Piece 8 lugs 6.5"
Dexter Trailer Axle, The Trailer Axles made in the USA. You can choose to use 16" Dual Tires and wheels or 17.5" Dual or Single Wheels with this axle. Please See Diagram Below on how to properly measure your axle.